My mom-in-law Maggie picked me up from home early Friday morning and we were on the road just after 6:30 a.m. I had barely slept after I came home from Portland to repack my suitcase for our trip but hot coffee in hand and the homemade cinnamon rolls we enjoyed was all I needed. We chatted during the drive out to Palm Springs, CA to join aunt Jan, grandma Nancy, and great-cousin Caroline who had arrived there the day before. This reunion is the third annual girl get-together connecting five women from three states: California, Nevada, and Wisconsin. When we pulled in to the driveway of the condo where we would stay, we left all the rules at the door--no commitments or deadlines. From that point forward the only time we cared about was fun girl time...time to eat, time to drink, time to rest and lay by the pool, eat what we want, when we want, we didn't have to do anything we didn't want to. And three full days of it! The first day we soaked in the hot tub while the snow fell on the surrounding mountains before cleaning up for dinner at Dink's Restaurant. The garlic cheese bread, flying shrimp on a grilled slice of pineapple and peanut dipping sauce, blues burger, seafood kabobs, skirt steak with chimichurri, and alderwood roasted wild salmon was fabulous. Then went home and watched the movie, Castaway. The next day we got up and made breakfast of homemade cinnamon roles, coffee, tea, and fresh fruit salad (some were picked from the trees outside). After shopping at the River and stores on El Paseo Drive, we had lunch at Fresh Agave Mexican Bar and Grill. Though I didn't have any, I heard that their margaritas are really strong (it did the trick for this mom who walked out happy with her husband and two kids). The guacamole fiesta, carne asada and fish tacos, shrimp cocktail, and wet beef burritos were absolutely tasty! We kept dinner light with hors' de vours of mahogany chicken wings (Grandma's recipe), meat stuffed wontons, and salad - yum! Our movie for the night was The Rock. Sunday I made breakfast: shredded pork and carne asada hash with fresh fruit salad. We hung by the pool all day. Grandma, Maggie, and Caroline played cards while Jan swam and I gave everyone a massage. Then I napped by the pool for hours and evened out my tan lines from cycling. When evening came we grilled filet mignon, asparagus, and potatoes served with a beautiful tomato avocado salad -- delicious!! The ladies sat around and read their books while I closed my eyes and eventually fell asleep. Today was our last day together. 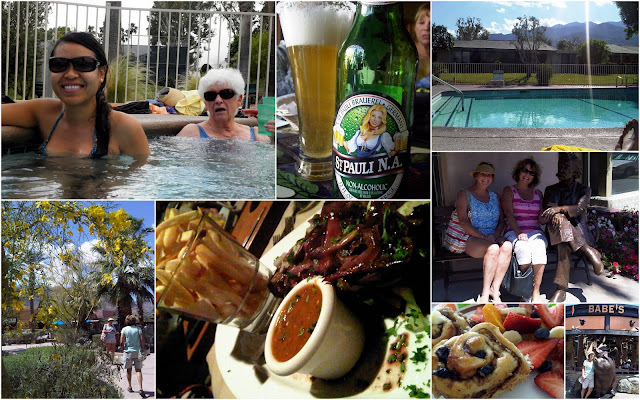 We went to old downtown Palm Springs and did some more shopping. Finally we had lunch at Tyler's Old Fashioned Hamburgers and boy-oy-boy were their burgers, fries, malt shake, and coleslaw mouthwatering delicious!! 'A Hamburger Girl's Dream' as Jan put it and indeed it was. Maggie and I enjoyed our drive home. We still had much to talk about --raving about our weekend and made plans for next year. I must admit I had butterflies in my stomach when I saw the Vegas skyline. I would soon be home and was excited to see John, Havi, and Elgy whom I have missed so much!! More photos to come from Jan's camera. Most of these were taken with my phone. I wore the Malibu Strings suit I wanted and received for my birthday. Grandma has only seen me wearing g-strings by the pool; I don't think I've ever worn full bottoms around her, LOL. @Scott: the weather has not been favorable to wear a bikini. Too cold and windy so I am hoping it heats up soon! !